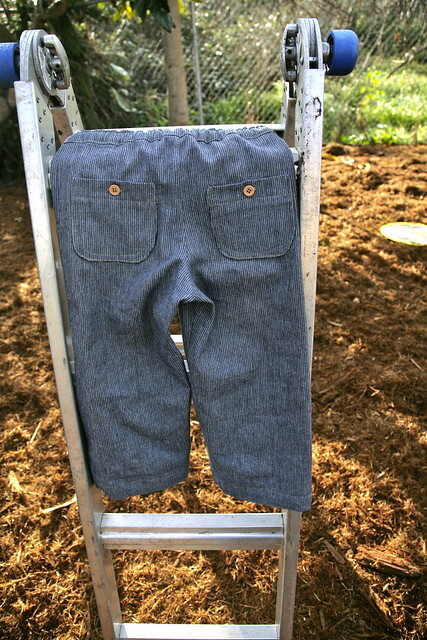 Inder Loves Folk Art: Sandbox Pants. 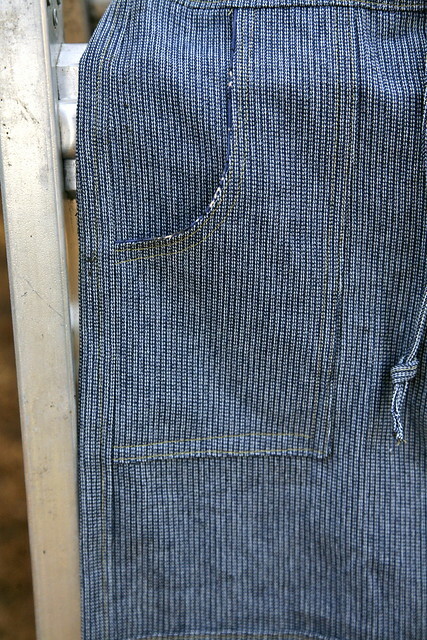 I made another, more complicated project this past weekend: a new pair of jeans for Joe. The current state of Joe's pants drawer is pretty dismal: all of his pants are either too warm for Spring weather, too beat up, or too small. My little ragamuffin has been looking especially ragamuffin-y lately. So I opted to try a new (to me) pattern, the "Sandbox Pants" from Oliver + s. I bought this pattern in size 4-8 right before the paper pattern went out of print (you can still download the pattern digitally). I love the casual "cargo" styling of these pants. Perfect for my rough-and-tumble little boy. Since Joe is now solidly a size 3T, I figured I could get away with sewing these up in a size 4, making no adjustments except to length. Inspired by Steve's work pants, which have reinforced knees, I added a reinforced knee panel to Joe's pants as well. Joe spends a lot of time on his hands and knees, pushing trucks around the back patio, and the knees of his pants reflect this abuse. 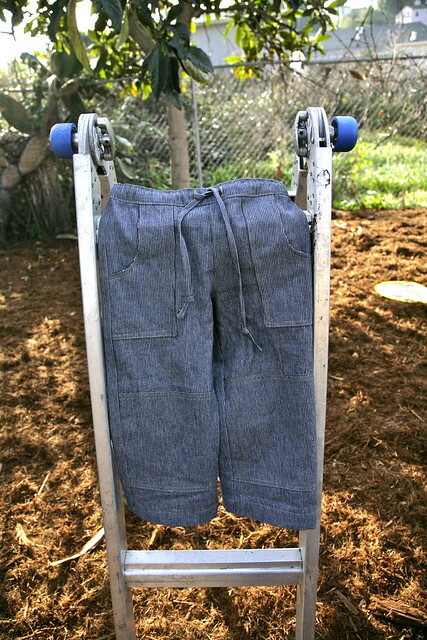 I wanted these to be Spring-appropriate pants, so I used a lightweight denim that may look familiar to some of you. I wanted these to be sturdy and casual, like ready-to-wear pants, so I edgestitched and topstitched everything on these pants, in contrasting yellow-gold "jeans" thread, and mock-flat-felled the side seams (there wasn't enough seam allowance to do regular flat-felled seams). The pockets are lined in a blue "bandana" fabric that no one will ever see (I should have photographed it before sewing the pockets on, because now you'll never see it either! sorry). Super cute. Too bad they're totally huge! It turns out there's a pretty big difference between sizes 3T and 4. These photos show that (a) the pants are way too long and have to be rolled up substantially to be wearable; and (b) that the reinforced knees are nowhere near Joe's actual knees. What these photos don't show is (c) the waist is too loose, even with the drawstring drawn up as tight as possible, and the pants show all kinds of preschooler plumber crack; and (d) the crotch is way too long, giving these pants a sort of Oakland gang-banger appearance (and like our neighbors, Joe would have to hike them up as he walks). Doh! These pants were a lot of work! And Joe doesn't need pants next year. He needs pants now. Drat. Conclusion: This pattern totally rocks, and I think these pants turned out great. When Joe is a little bigger, I'm going to make a million pairs of these, because I love them. Actually, I love them so much, I'm tempted to buy the digital pattern in the smaller size, just to get that 3T size (since these are big in pretty much every possible way, grading down the size 4 is a bit beyond my abilities). Think about it, these pants would be totally adorable on a little girl, too, so really I wouldn't be buying a $10 pattern for just one size, right? 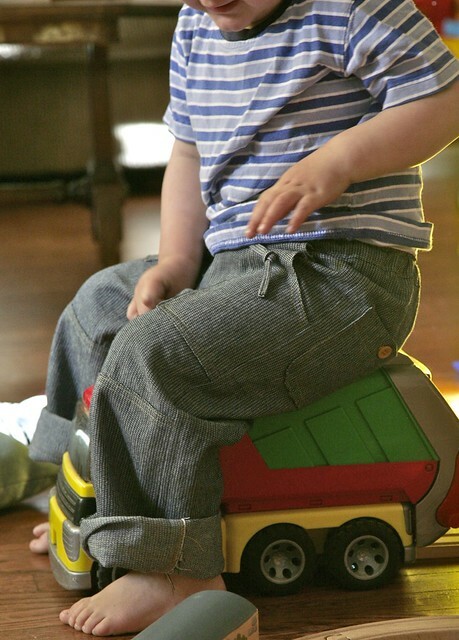 Anyway, I guess Joe will just have just to grow into these. Rather than try to modify them to fit Joe now, I think I will just tuck them away until he's a bit bigger. No way I'm going to rip out all of those beautiful, double-stitched seams. In the meantime, I better get cracking on making some pants that actually fit him right now. 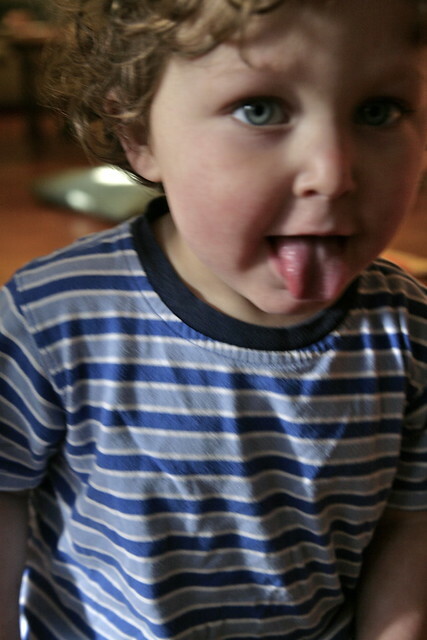 And here's some blurry, gratuitous cuteness. They turned out so nice! Definitely put them away until he grows into them. My vote is that buying the other size is totally worth it but then I'm kind of a O&S junkie. I'm making more for my little guy and also plan to make some in a shorts length for him for this summer. You've helped talk me into buying the smaller size ... I think I'll get plenty of use from it! Oh my god, he's a teenager! I don't know if this happened in the last few days or what, but Joe is such a BIG KID. That photo where he's sitting on the truck belongs in a teenybopper magazine - it's his dreamboat photo. Yikes! I keep thinking he can't get cuter, AND THEN HE DOES. Oh, and the pants are lovely. You have a certain special style. I know you talk about being casual and practical, but everything you make is so attractive. I suppose it's all in the little details and your eye for fabric. Anyway, love the pants and WANT TO EAT JOE UP. Melissa!! Shhhhh! He is NOT a teenager!! Be quiet, you! So cute! And while it's frustrating that they are too big, at least you know they will fit eventually. I love all the details. P.S.-Congrats on the little gal on the way, one of each how fun! oh, they are so cute! I always try to make everything I sew for my daughter too big since she grows so fast, and I find it isn't long before she can wear it. 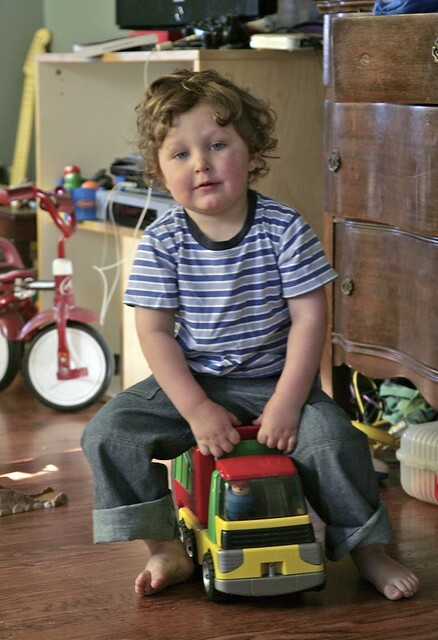 I have the opposite problem with some of my Oliver & S patterns now--I bought them in the baby size that only goes up to 24 months, but my 20-month old is now wearing 3T sizes. Yes, he'll eventually grow into them! But his growth has really slowed in the past year so it's hard to say when. Like your daughter, he shot up in the charts until he was about 2, then plateaued. Now he seems to be lengthening out and not putting on the pounds like he did. (He's also a little more "normal" on the charts now - like, 75th percentile instead of 99th.) Long story, but you may find that Z. stays in her 3T stuff for a little while! Oh they are so lovely! AND he'll grow into them!!! !